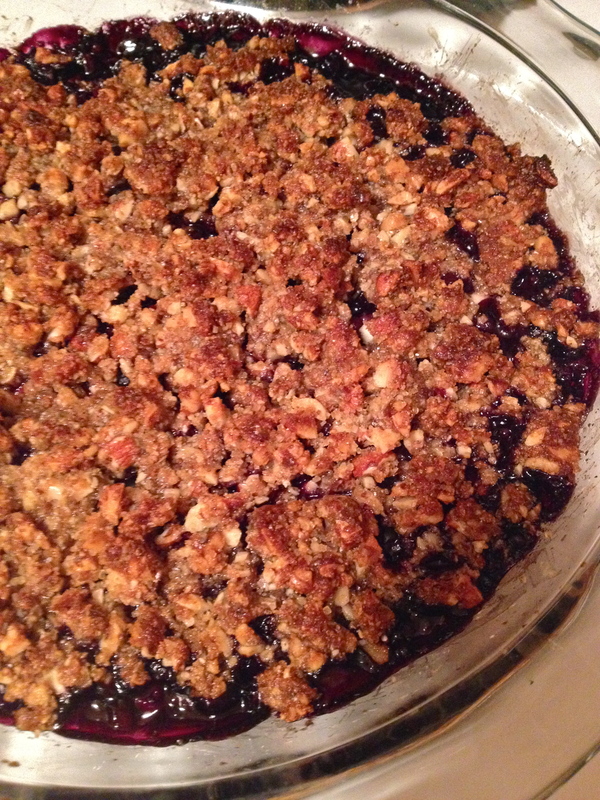 I loved the blueberry almond crisp recipe I posted last time SO MUCH that I’ve made it twice since then. It has that great balance of nutty, buttery, and sweet that I’ve found pretty addicting lately. 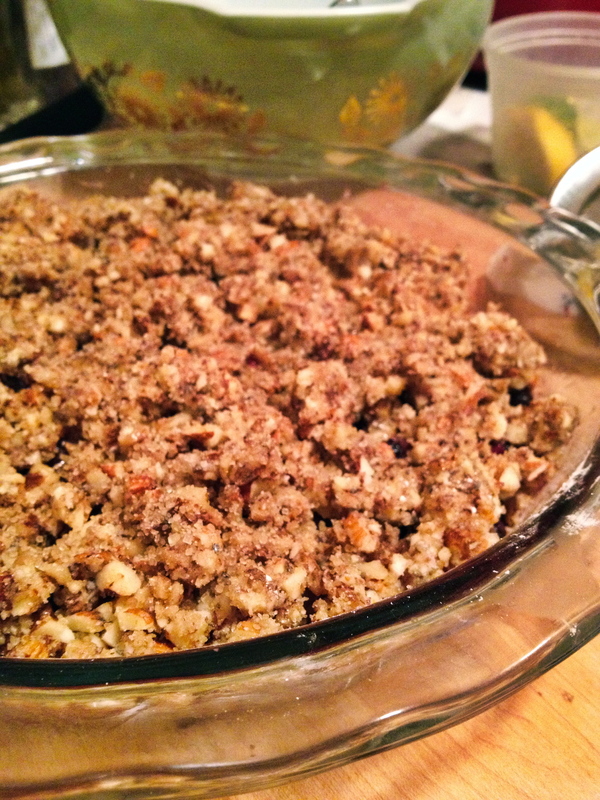 And after a few tweaks and additions, I have another crisp recipe to share. It’s the nutritionally-amplified fruit dessert of my health food dreams, packing in tons of superfoods: almonds and walnuts, flax seeds and chia seeds, and any mixture of berries your heart desires (I used blueberries, but Trader Joe’s frozen section has a nice mixed berry medley that I bought for next time!). This superfood berry crisp works overtime to give your body what it needs, in terms of both nutrition and sweet tooth satisfaction. And while these healthy ingredients are totally awesome, I think I may start a petition to give butter and brown sugar their own superfood status (their kind of “super” is slightly different, however). Then there would be no stopping this thing! In a mixing bowl, stir together ground almonds, chopped almonds, chopped walnuts, flax seed, chia seed, salt, and brown sugar. Use a fork to work the cold butter into the dry mixture until there are no more chunks of butter. Then add the vanilla and stir. In a pie pan or other baking dish, stir together the berries and lemon juice. Then add the corn starch and sugar and stir to coat. 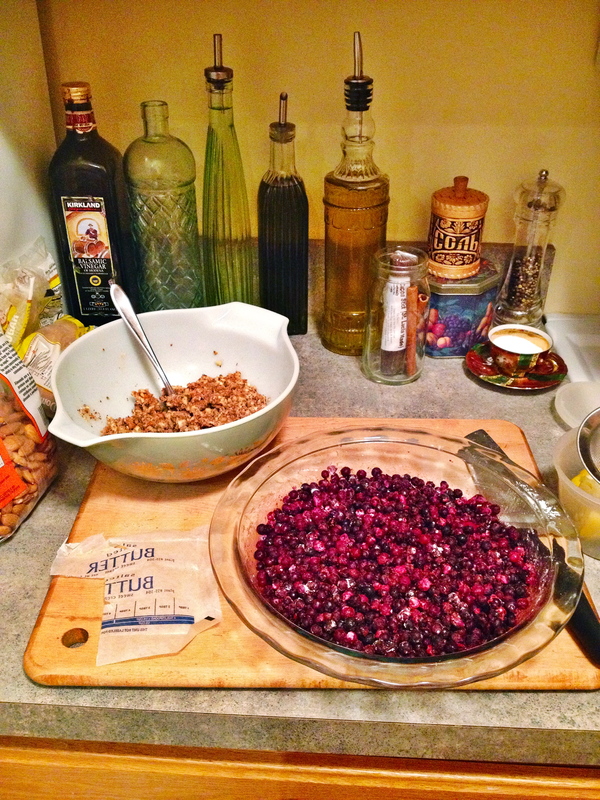 Starting at the outside and working your way to the middle, sprinkle the nut mixture over the top of the berries. Then finish with a sprinkle of turbinado sugar for an extra bit of sweetness and crunch. Lightly lay a sheet of tinfoil over the pan, but don’t tuck the ends around the pan. This keeps the nuts from browning too quickly as the fruit bakes. Bake until the fruit filling is bubbling and the topping is fragrant and browned, about 15-25 minutes. 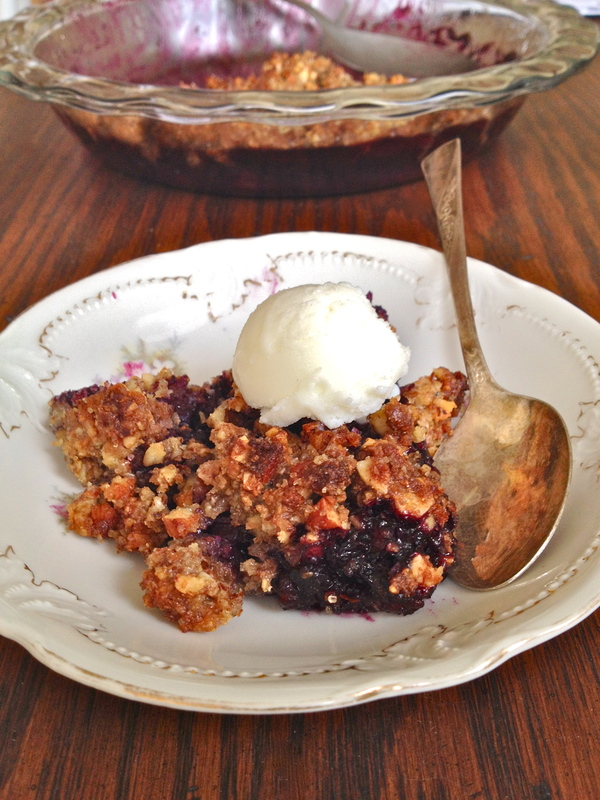 Let the crisp cool slightly and serve warm with a scoop of ice cream, or frozen Greek yogurt. Another superfood, look at that! I forget – what did I say about how to serve this? Was it, “use a spoon and eat it right out of the pan even if it’s too hot”? Because that’s a pretty good way, too. 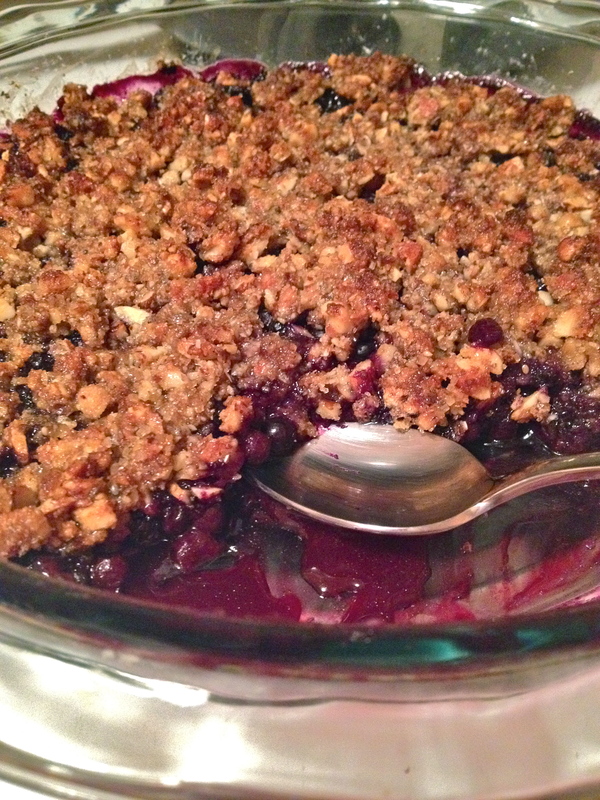 Previous Blueberry Almond Crisp in a Skillet. Next Toasted Marshmallow Coffee Brownies. How could it get any better.? You are killing me Kell! This looks so incredible and I think its GF!!! Beautiful pics and written so well Kel, smooches.